Jeff Parsons for suggesting this Tidbit of Humor December 25, 2017. Two blondes walk into a tanning salon. The receptionist asks, "Are you two sisters?" "Heck, no, we aren't even Catholic! Jeff Parsons for suggesting this Tidbit of Humor April 14, 2009. A blonde calls her boyfriend and says, "Please come over here and Help me !" "I have a difficult jigsaw puzzle, and I can't figure out how to get it started." He studies the pieces for a second, looks at the box, then turns to her and says, "First of all, no matter what we do, we're not going to be able to assemble these pieces into anything resembling a tiger." "then let's put all these Frosted Flakes back in the box." Many thanks to Cynthia Waters for suggesting this Tidbit of Humor August 29, 2007. Two blondes in Oklahoma were sitting on a bench one evening. There was a beautiful full Moon hanging low in the sky. One blonde turned to the other and said, "Which do you think is farther away: Florida or the Moon?" The other blonde looked up at the Moon and said, "Hellooo! Can you see Florida? Many thanks to Jeff Parsons for suggesting this Tidbit of Humor September 20, 2011. A few days ago I was having some work done at my local garage. A blonde came in and asked for a "seven-hundred-ten". She pointed and said, 'Of course, it’s right there.' The mechanic nearly fainted. By God, she was right! There it was, just where it's always been! You've all seen it on one car or another over the years. 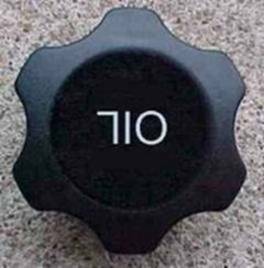 If you're still not sure what a 710 is, look at the first photo below this message. If you think this story is a fluke, check out the other Blonde Stories on this webpage. Many thanks to Cynthia Waters for suggesting this Tidbit of Humor August 11, 2007. Three Blondes applied for the last available position with the local FBI office. The agent conducting the interview looked at the three of them and said "So you want to be FBI agents, huh?" The blondes all nodded. The agent got up, opened a file drawer and pulled out a folder. Sitting back down, he opened it and pulled out a picture, and said, "To be an agent, you have to be able to be a detective. You must be able to notice things such as distinguishing features and oddities such as scars and so forth." The agent shook his head and said, "Of course he has only one eye in this picture! It's a profile of his face! You're dismissed!" The first blonde hung her head and walked out of the office. The agent then turned to the second blonde, stuck the photo in her face for two seconds, pulled it back and said, "What about you? Notice anything unusual or outstanding about this man?" The agent put his head in his hands and exclaimed, "Didn't you hear what I just told the other lady? This is a side view of the man's face! Of course you can only see one ear!! You're excused too!" The second blonde sheepishly walked out of the office. The agent turned his attention to the third and last blonde and thought: “This is probably a waste of time, but . . " He flashed the photo in her face for a couple of seconds and withdrew it, saying, "All right, did you notice anything distinguishing or unusual about this man?" The blonde said, "I sure did. This man is wearing a contact lens." The agent frowned, took another look at the picture and began looking at some of the papers in the folder. The blonde rolled her eyes and said, "Well, Helloooo! With only one eye and one ear, he certainly can't wear glasses." Many thanks to Cynthia Waters for suggesting this Tidbit of Humor April 27, 2006. A blonde was speeding down the road in her little red sports car when she was pulled over by a blonde police officer in her squad car. The cop asked to see the blonde's driver's license. She dug through her purse and was getting progressively more agitated. Finally she looked up at the blonde cop and said, "What does the license look like?" The policewoman replied, "It's square and it has your picture on it." The blonde finally found a square mirror in her purse, looked at it and handed it to the policewoman. The blonde officer looked at the mirror, then handed it back saying, "Okay, you can go. I didn't realize you were a cop." Many thanks to Cynthia Waters for suggesting this Tidbit of Humor April 15, 2006. A man entered the bus with both of his front pockets full of golf balls and sat down next to a beautiful (you guessed it) blonde. The puzzled blonde kept looking at him and his bulging pockets. A young man wanted to get his beautiful blonde wife, Susie, something nice for their first wedding anniversary. So he decided to buy her a cell phone. He showed her the phone and explained to her all of its features. Susie was excited to receive the gift and simply adored her new phone. Susie replied, "I just love it! It's so small and your voice is clear as a bell, but there's one thing I don't understand though..."
A blonde was shopping at Macy's and came across a silver thermos. She was quite fascinated by it, so she picked it up and brought it over to the sales manager to ask what it was. The manager said, "That's a thermos . . . it keeps some things hot and some things cold." "Wow, said the blonde, "that's amazing. I'm going to buy it!" So she bought the thermos and took it to work the next day. Her secretary saw it on her desk "What do you have there?" she asked. "Why, that's a thermos . it keeps hot things hot and cold things cold," she replied. Her secretary inquired, "What do you have in it?" The blond replied, "Two Popsicles, and some coffee". A blonde went to an eye doctor to have her eyes checked for glasses. The doctor directed her to read various letters with the left eye while covering the right eye. 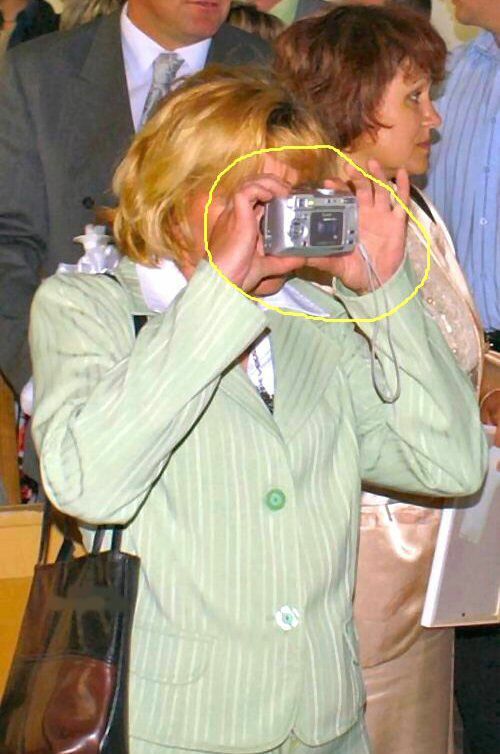 The blonde was so mixed up on which eye was which that the eye doctor, in disgust, took a paper lunch bag with a hole to see through, covered up the appropriate eye and asked her to read the letters. As he did so, he noticed the blonde had tears streaming down her face. "Tell me," said the doctor, "why are you getting so emotional about getting glasses?" "You see, Doctor," agreed the blonde, "I kind of had my heart set on wire frames." Many thanks to Cynthia Waters for suggesting this Tidbit of Humor August 17, 2005. A blonde was driving her car about two hours from San Diego when she was flagged down by a man whose truck had broken down. The man walked up to the car and asked, "Are you going to San Diego?" "Sure," answered the blonde, "do you need a lift?" With a screech of brakes he pulled off the road and ran over to the blonde. "What the heck are you doing here?" he demanded, "I gave you $100 to take these chimpanzees to the San Diego Zoo." "Yes, I know you did," said the blonde, "but we had money left over so now we're going to Sea World!" Many thanks to Cynthia Waters for suggesting this Tidbit of Humor Nov 14, 2004. At the famous Mall of America in Minneapolis a power outage hit during the middle of a busy weekend shopping day. Security guards were sent to rescue 39 blondes who were stranded in various parts of the large indoor mall. Eventually security guards located all the blondes and escorted them to safety from the escalators on which they had been stuck for several hours. No one was hurt, but guards reported that three of the blondes complained about the time they lost from their shopping trip, one had cracked the finergnail polish on her middle finger, and three more were in tears and had to re-do their makeup. All the rest were still talking on their designer cell phones when the guards arrived and interrupted their conversations briefly to thank their rescuers. Many thanks to Cynthia Waters for sending along this Tidbit of Humor Nov 8, 2004. A blonde bought two horses, and could never remember which was which. A neighbor suggested that she cut the tail of one horse and that worked great until the other horse got his tail caught in a bush. It tore just right and looked exactly like the other horse's tail and our friend was stuck again. Another neighbor suggested she notch the ear off one horse. That worked fine until the other horse caught his ear on a barbed wire fence. Once again our friend couldn't tell them apart. Her boy friend suggested that she measure the horses for height. When she did, she was very pleased to find that the white horse was 2 inches taller than the black, and never had a problem telling them apart again. A blonde bought a plane ticket to Miami in Coach. When she got on the plane she sat in First Class. The stewardess checks her ticket once she's seated, and tells her, "I'm so sorry, this is a Coach Ticket and you are sitting in First Class." The blonde refuses to leave, so the stewardess leaves to get the pilot. The pilot comes to First Class, leans over and whispers something into the blonde's ear. She immediately gets up and moves back into the Coach Seaction. The stewardess looks amazed and says,"What did you say?" The pilot said, "I told her First Class isn't going to Miami, only Coach." Many thanks to Ginger Thiele for sending along this Tidbit of Humor Jan 30, 2004. I am an 82 year old senior. I am tired of people treating me like I am an ignorant young child. Last year I had several windows in my house replaced. They were the expensive double-insulated, energy efficient windows. This week I received a call from the contractor, complaining that the work has been done for a year and that I had failed to pay for them. My gracious, did we go round and round! I told him that no one pulls a fast one on this old lady! Even though I am a senior citizen and I was a blonde in my younger days that doesn't mean that I am automatically stupid! I proceeded to tell him exactly what his salesman told me last year: "In one year, they will pay for themselves"!!! Many thanks to Cynthia Waters for sending along this Tidbit of Humor June 2, 2003. Tiffany, a platinum blonde, was driving home after work, and got pelted in a heavy hailstorm. Her car was covered with dents, so the next day she took it to Bob's repair shop. Bob was very busy, so he decided to have some fun with Tiffany. He told her just to go home and blow into the tail pipe really hard, and all the dents would pop out. He figured she'd be back the next day when it didn't work. Tiffany went went home, got down on her hands and knees and started blowing into her car's tailpipe. Nothing happened. She blew a little harder, and still nothing happened. Her roommate, another blonde, came home and asked, "What are you doing?" Tiffany told her how the repairman had instructed her to blow into the tailpipe in order to get all the dents to pop out. "HELLLLOOOO! ... You gotta roll up the windowwwws! ! !" Many thanks to Cynthia Waters for sending along many of these blonde Tidbits of Humor. Also thanks to Ginger Thiele and several other collaborators. Two blondes who went deep into the woods searching for the perfect Christmas tree. After hours and hours of subzero temperatures and a few closecalls with hungry wolves, one blonde turned to the other and said, "I'm chopping down the next tree we see. I don't care anymore whether it's decorated or not!" A blonde from Miami was visiting some friends in Wisconsin for the Christmas holidays. As she does every day to keep her figure, she went out jogging in the morning --- despite the freezing cold weather. As she was jogging along she saw this truck pass slowly and noticed something strange. Wanting to be helpful she ran alongside the cab of the truck and rapped on the window, shouting to the driver, "You're losing your load." The driver ignored her. She did it again. Finally, the driver rolled down his window, "Lady, I'm putting salt on the road." 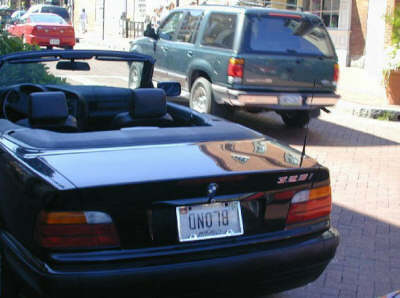 How do you know it's a blonde's BMW? Read the license plate. A girl was visiting her blond friend and noticed that she had just acquired two new dogs. "What's their names?" she asked. "I call one Timex and the other Rolex," she replied. Her girl friend said incredulously, "Whoever heard of someone naming dogs like that?" "HelOOOoo!" said the blonde, "they're Watch Dogs!" A blonde girl enters a store that sells curtains. "I would like to buy a pink curtain in the size of my computer screen." "But, madam, computers do not have curtains!!!" A blonde calls her boyfriend and says, "Please come over here and help me. I have a killer jigsaw puzzle and I can't figure out how to get it started." Her boyfriend asks, "What is it supposed to be when it's finished"? He studies the pieces for a moment, then looks at the box, then turns to her and says, "First of all, no matter what we do, we're not going to be able to assemble these pieces into anything resembling a tiger." He held her hand and said, "Second, I'd advise you to relax. Let's have a cup of coffee, then . . . ," he sighed, "let's put all these Frosted Flakes back in the box." A blonde is walking down the street with her blouse open and her right breast hanging out. A policeman approaches her and says, "Ma'am, are you ware that I could cite you for indecent exposure?" She looks down and says, "OH MY GOD! I left my baby on the bus again!" The Russian said, 'We were the first in space!" A blonde was playing Trivia! l Pursuit one night. It was her turn. She rolled the dice and she landed on Science & Nature. Her question was, "If you are in a vacuum and someone calls your name, can you hear it?" Within half an hour she is all done, whereas the rest of the class is still sweating it out. During the last few minutes she is seen desperately throwing the coin, muttering and sweating. The moderator, alarmed,approaches her and asks what is going on. "I finished the exam ! in half an hour, but now I'm rechecking my answers." One day my husband, decided to wash his sweatshirt. "What setting do I use on the Washing Machine?" He yelled back, "Dallas Cowboys"
And they say we blondes are dumb. I was checking out at the local A&P with just a few items and the lady behind me put her things on the belt close to mine. I picked up one of those "Dividers" that they keep by the cash register and placed it between our things so they wouldn't get mixed. After the blonde at the register had scanned all of my items, she picked up the "Divider" --- looking it all over for the bar code so she could scan it. Not finding the bar code she said to me, "Do you know how much this is?" I said to her "I've changed my mind, I don't think I'll buy that today." She said "OK" and I paid her for the things and left. She had no clue to what had just happened. A blonde at work was seen putting a credit card into her floppy drive and pulling it out very quickly. When inquired as to what she was doing, she said she was shopping on the Internet and they kept asking for a credit card number, so she was using the ATM "thingy." I recently saw a distraught young blonde weeping beside her BMW. "Do you need some help?" I asked. She replied, "I knew I should have replaced the battery to this remote door unlocker. Now I can't get into my car. Do you think they (pointing to a distant convenience store) would have a battery to fit this?" "Hmmm, I dunno." Do you have an alarm too?" I asked. 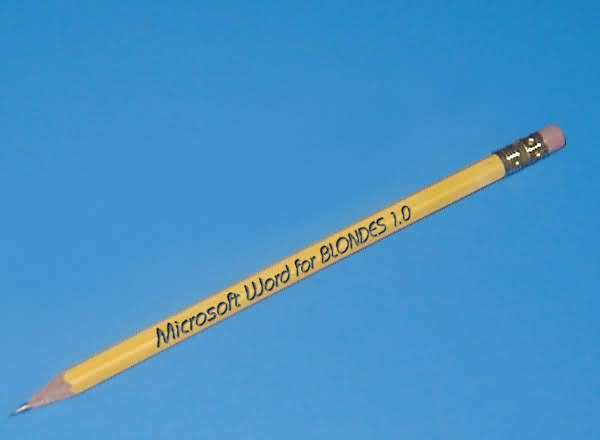 Several years ago, we had a blond Intern who was none too swift. One day she was typing and turned to a secretary and said, "I'm almost out of typing paper. "What do I do?"